Well, the kitchen is all done, yes I should post some pictures at some point, and I'm getting a lot of joy from cooking and baking again. 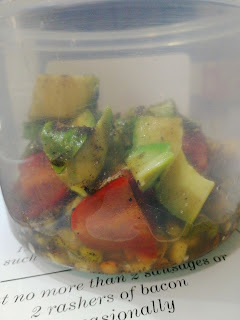 I started taking lunches to work, and whilst trying to be healthy, I'm also trying to keep my food interesting too. It's hard to be surrounded by delicious food all day and I'm so hungry by my break that it's too easy to grab something from the shop. Lately, I have been making a small layered salad, and adding some flavour pizazz in the form of some Indian "chat" (or "chaat") masala. It's a gently spicy, sour, pungent, punchy powder that gives that very distinctive flavour to Indian snack foods like chaat, bhel puri and many more. Some people add it to fruits, and that makes a very refreshing snack. If I'd been more organised, I'd have sprouted some lentils and beans and chickpeas myself, but instead I bought a pack of "salad toppers" sprouted lentils etc and used a third of the pack each time. I put the sprouted lentils in the bottom of my lunch pot, and sprinkled a little chat masala on top. 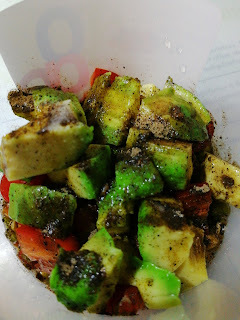 Then I quartered a handful of baby tomatoes and then I added half an avocado, also chopped up. A twist of salt and another sprinkling of chat masala followed by a good shake of lemon juice, and that's the salad done. It's very filling from the lentils and the chewing, and the flavours all make it very satisfying.